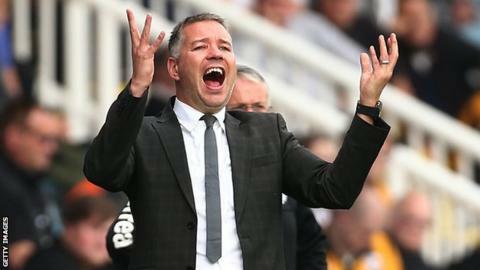 Peterborough boss Darren Ferguson says they have been prevented from signing a defender because of Nottingham Forest's late transfer payments. Posh are waiting on money for the summer transfer of Britt Assombalonga. "It's been really frustrating. We'd signed a centre-half that trained with us before the game against Notts County [on 24 January]," said Ferguson. "Then [his parent club] took him back and said they won't loan him out again. They'll sell him, but won't loan him." Ferguson, whose side are currently two points outside the League One play-off places, added: "I do feel we have to add to our squad. We've managed to get Tyrone [Barnett] out which was an important factor in terms of releasing those wages and getting a fee - but we just get on with it." Last week's 1-0 victory over League One's bottom club Yeovil was the first time this season that Ferguson had named the same 18-man squad two games in a row. "The consistency in results and performances is key to us turning this around and getting into the play-offs," Ferguson told BBC Radio Cambridgeshire. "For the first time in a long, long time I was able to do it last week and will be able to do it this week."